I was afraid that I wasn’t going to have enough time today to get anything done because I’m heading out to a hockey game shortly, but it turns out I’m quite satisfied with the progress I made today. 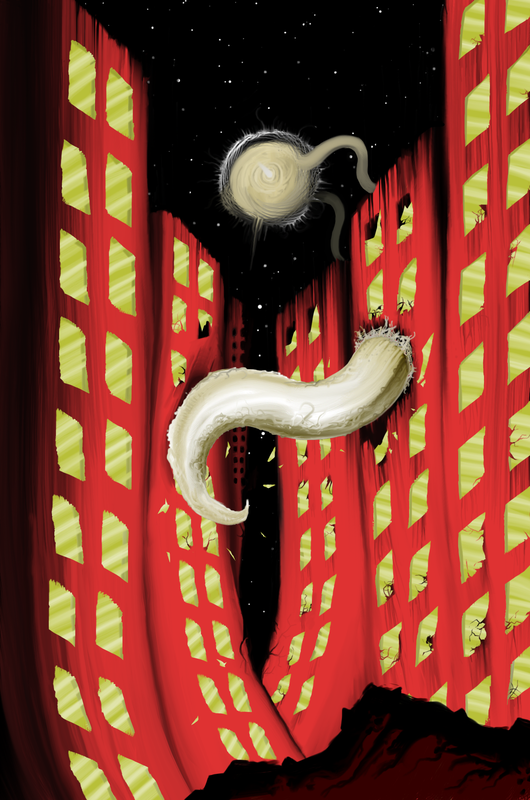 I was able to do another row of window wreckage, got started on some rubble on the ground, and I added some effects on one of the buildings on the left side so it looks like the tentacle is swiping it. Not too shabby. I still plan to do a crazy amount of touch ups on almost everything, but that will be something I’ll tackle sometime this week. I want to get ready to go, so I’ll cut this pretty short for today. I do want to mention, however, that I’m just a couple days away from hitting my 200th day. So on Tuesday I plan to go over everything I’ve been doing for the past 100 days. So that’s day 100 to 200 altogether. I’ll pick out a bunch of my favorite artwork and try and reflect on each one. Should be fun! Hope everyone has a fantastic week. Indeed! You’ve made me start thinking about why this thing would destroy this city in the first place. Thanks for the comment, Brad.